Bhawan Ruangsilp (Chulalongkorn University), "Politics of the Letters in Ayutthaya's Diplomatic Practice"
Kanako Kimura (Nagoya University), "The King of Ayutthaya's Golden Letter to the Ming Emperor"
Akiko Harada (Keio University), "Correspondence between Siam and the Vatican in the Seventeenth and Nineteenth Century"
Takashi Hasuda (Ritsumeikan Asia Pacific University), "Between trade and diplomacy: Adoptive son in the Japan-Vietnam relationship during the early seventeenth century"
Hiroshi Kawaguchi (Aichi University), "Siam-Vietnam Relations in the Reign of Rama I from a Broader Regional Perspective: The Exchange of Envoys and Letters between Siam, Vietnam, Burma and the Qing"
I had the pleasure of joining project members in this international workshop at the invitation of Professor Matsukata. We spent an enlightening and invigorating week in and around Bangkok, discussing our research through the formal venue of the workshop and more informally as we surveyed historical heritage sites. 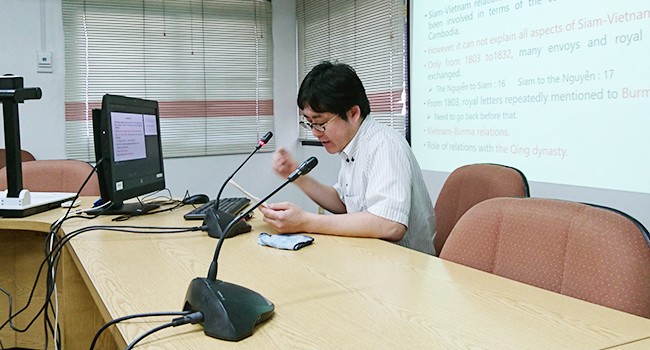 The workshop was held on Wednesday at the Chulalongkorn University campus. 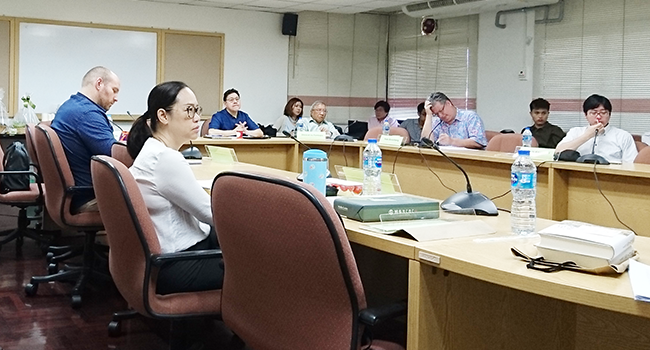 Participants’ work examined the diplomatic practices, expectations, and experiences of polities in East Asia, Southeast Asia, and the Malay world in their dealings with one another and with various European communities. I believe everyone left remembering the word puji-pujian, a phrase introduced by Professor Peter Borschberg denoting the recitation of titles and status at the head of Malay letters. 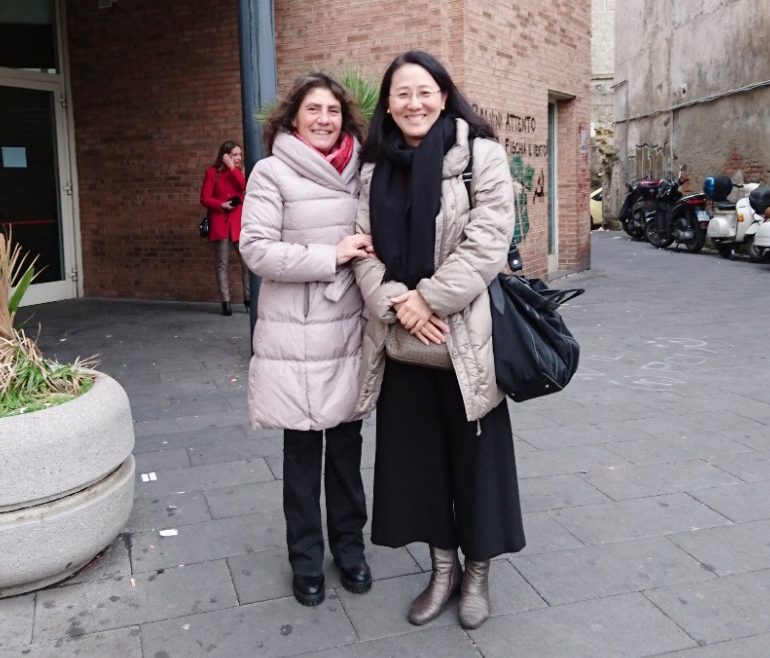 The word speaks to the larger challenge of the workshop and much of our research: namely, developing a framework for the study of historical foreign relations less dependent on the terms and concepts detailed by modern European diplomatic practice. Papers and discussion raised questions about how relations among polities manifested in economic practice, self-representation, and positioning between, within, and beyond hierarchies. What distinguishes a tax from a discounted sale, or an obligatory gift? When neither “sovereignty” nor “equality” appear to be salient concepts, what kinds of relationships were possible between rulers? As seen in multiple papers, often times these relations were described in personal terms. Similarly, “reciprocity” was suggested as a concept animating many of the dynamics highlighted across individual projects. The workshop served as a stepping stone for addressing these and other questions in more detail and in further collaboration. 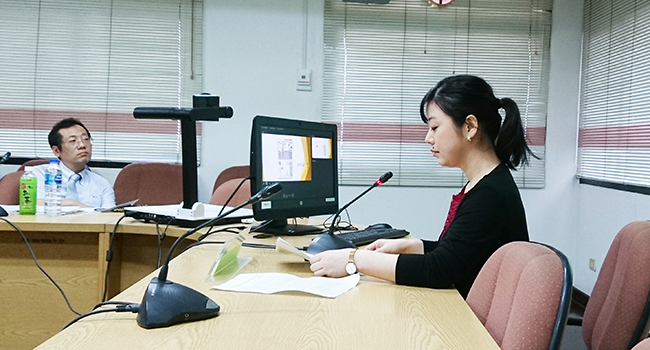 Group study tours of Bangkok and Ayutthaya bookended the workshop. In both cities, our hosts arranged for guided excursions led by experts. Dr. Sunait Chutintaranond accompanied the group to the temples around central Bangkok on Tuesday. The holiday schedule resulted in some unexpected closures at planned sites, but Dr. Chutintaranond kindly put his extensive knowledge to use on tours of alternative sites such as Wat Pho. 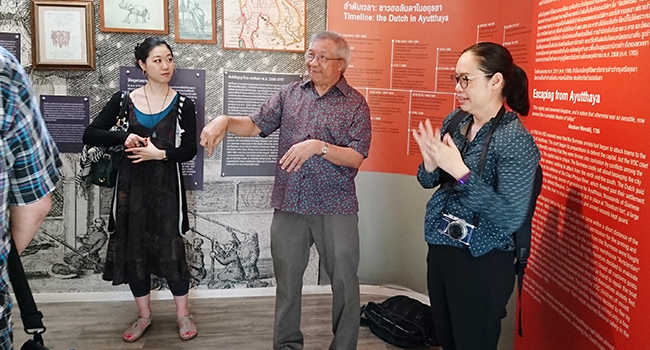 In Ayutthaya on Thursday, Professor Julispong Chularatana led us through the former royal temple (Wat Phra Sri Sanphet) and surrounding complexes (Wat Mahathat and Ratchabunara) at the northern end of the old capital. Our tour of Ayutthaya was a personal highlight, bringing to life a city I often read about but could never picture. Surrounded on all sides by rivers, I saw our hosts’ point that Ayutthaya functioned as a true port, and one very much connected with the wider networks of maritime Asia. We spent our afternoon in Ayutthaya touring local museums, prompting informal discussion of museum and exhibition design and the historian’s role in each. We visited Chao Sam Phraya National Museum, with its dazzling collection of gold pieces, and learned of the exhibition’s origins in the folly of some overexuberant grave robbers a half century prior. The group also visited museums at the historical settlements for the Japanese and Dutch (VOC) communities. The latter in particular catalyzed our discussion of museology, as we were accompanied by the initial museum director as well as a member of the foundation board overseeing its establishment (Dr. Dhiravat na Pombejra, who also presented at the workshop). Our Friday, the group struck out on its own, visiting the Royal Palace as well as Phra Nakorn National Museum and Museum Siam. The latter housed an exhibition dedicated to the question of “Thainess,” prompting discussion of how nation and identity are displayed in museums in Japan and America, my country of origin. Throughout, our hosts—especially Dr. Bhawan Ruangsilp—were friendly, informative, and extremely well-organized. The trip’s success is in no small part due to their efforts and hospitality. I appreciated being exposed to the work of Thai scholars and scholarship on Southeast Asia, a welcome reminder of the variety of people tackling similar issues across the globe. The group came away eager to continue collaborating well into the future. More immediately, participants’ papers are to revised for journal publication, where I hope they will prompt similar questions on the nature of “Correspondence between Crowns” for a wider audience. © MATSUKATA Fuyuko, All rights reserved.